Bayside Body Shop, which has operated locally for 15 years, was featured in the October edition of Autobody News, a nationally distributed print and online trade magazine that covers the automobile body repair business. Bayside is owned by Brian Holland who, along with his wife, Lisa and daughter Carolann, run the day-to-day activities along with 11 other employees. The business opened in 2003 in a 2,000-square-foot building. 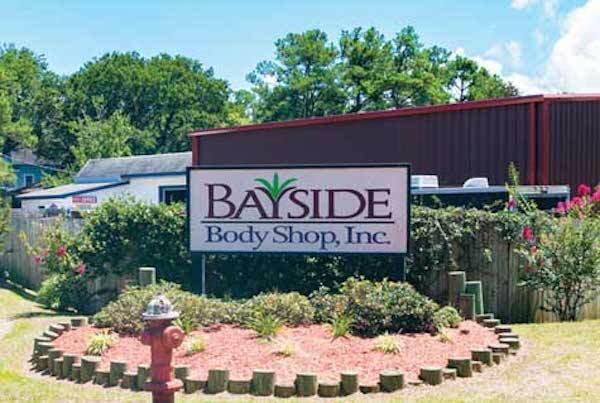 Since that time, Bayside has expanded their facility at 1205 5th Ave. in Kill Devil Hills to 8,000 square feet and added mechanical work to their body shop business. The article highlights the success Bayside Body Shop has had using the online product ALLDATA. ALLDATA is a major data provider to help properly repair and diagnose OEM (original equipment manufacturer) the way the original vehicle manufacturer intended. The company states it is the largest single source of OEM information in the world, and over 300,000 technicians in the United States and around the globe use the service. Brian Holland is a US Air Force Veteran, serving as an Aircraft Launching and Arrestment Systems Inspector. He met his wife Lisa at his last duty station in California in 1991. They have been married 27 years and have 3 daughters. They moved to the Outer Banks in 1996. They did front end repair on my wife’s 2014 beetle a couple of years ago. Body part fit and paint match were excellent. I would go back to them again. A Home Depot light pole crushed the roof of my car two days after we moved here in February 2017. Bayside did an excellent job repairing our car. I would recommend them to anyone needing body work.